Nikki Kathcart is a former camper and Teen Staffer and she worked on Summer Staff at Youthfront Camps for a couple of years as the Ropes Course Supervisor and the Teen Staff Supervisor. Earlier this year, she came back to camp as a Volunteer Cabin Leader with her church. She took some time to share her story with us. Q: Why did you want to volunteer as a Cabin Leader this summer? A: This year, I wanted to volunteer as a Cabin Leader because we were bringing a group of middle school and high school students down, and we love them. We wanted to get to spend more time with them and help them get away from the hustle and bustle of their daily lives, and take away their cell phones and make them actually talk and hang out with each other. Q: What are some of your favorite aspects of Youthfront, and why have you kept wanting to come back? A: I fell in love with Youthfront because Youthfront is where I fell in love with Jesus. Ever since I was in sixth grade and was saved at Youthfront Camp West, I have always wanted to give back, so I just keep coming back. It’s really helped me have more of a servant heart, and helped keep me focus on serving others and on God, and my relationship with God. Q: How has Youthfront helped guide you through the noise of life? A: I think camp puts into perspective what’s important. It removes you from all of the stresses and anxieties that you have just living with all of the technology and things that we fill up our lives to distract us from God. I just feel like coming back here, it’s a retreat; you’re able to refocus your eyes on all of the things that are eternal, instead of all of the things that really don’t matter in life. It just kind of helps set your priorities back in line. 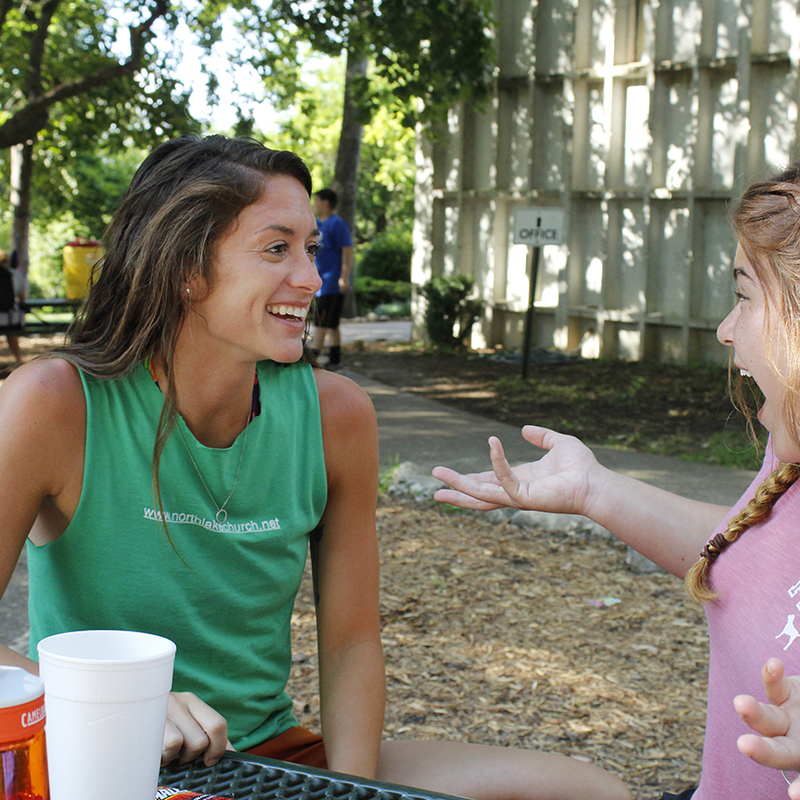 Q: Since you have experienced being a camper, Teen Staffer, Summer Staffer and now cabin leader here, can you describe what it was like, at different stages of your life, to live amongst your fellow campers, Teen Staffers, etc.? A: As a camper, I feel like I got to see the cabin leaders and the staff be role models for what my life could look like if I focused it on Christ. Then as a Teen Staffer, I feel like my heart got molded to be more servant-hearted in looking for the needs of others. Then I got to be a Teen Staff Supervisor which was amazing being able to pour into the Teen Staff and just being able to help them find their path through life, teaching them how to depend on God and how to lean into God, and how Jesus was a servant—so using that model and really instilling it into their lives. Then as a Volunteer Cabin Leader, it’s just awesome being able to go and have fun and be crazy during the day and during free time, but then at night being able to use the relationships that we’re building, while we’re having fun, to dive deeper into the Word and being real and honest with each other—so just that relational aspect is fun. Q: Do you have a distinct memory of either you encountering God here at camp, or witnessing a camper or fellow staff member encountering God? A: I remember as a Ropes Course Supervisor, we used to go off as a program staff and pair up two-by-two, and walk the cabins and pray over each cabin—not necessarily go inside, but just walk outside and go on a prayer walk. We do that as Teen Staff as well. Those were the times where I feel like I felt closer to God, just walking past each cabin and praying over all of the conversations, all of the activities, and all of the experiences that the campers got to go through. I just really felt like that was a good time to hear God speak to us. We got to pray on behalf of the campers, the cabin leaders, and the whole program; we just got to really fight for the campers in prayer, and I felt honored to do that. Q: If you were talking with somebody who had never heard of Youthfront before, what aspects of the camp would you share with them? A: To someone who had never heard of Youthfront, I would say it’s a great place to retreat and to focus on your relationship with God, and you will find people here that are your lifelong friends. That sounds so corny, but it’s so true. The relationships that are built here are unmatchable and they truly are forever. I still catch up with all of my Teen Staff, and some of them work here now and are on Summer Staff. I just feel like it’s one of those experiences that you will never forget. When the foundation is Christ, I feel like it’s so much easier to build friendships and relationships, and be able to open up to each other so much more, and on a completely different level than you necessarily do with your friends at school or your family; it’s just a whole different level of camaraderie.